Check out some great photos of classes and the parade! 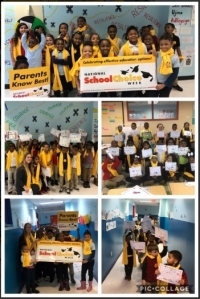 Imagine Bella students participated in National School Choice Week this year with a big parade! All students received a yellow school choice week scarf which was just in time for the snowy and cold weather! Since it was chilly outside, students paraded through the halls of the school. As students visited each floor they said cheers, carried banners, and signs they made about how much they love their teachers and school.